Recently I read a quote from the legendary Henry Ford that " There is joy in work. There is no happiness except in the realization that we have accomplished something." when I started my blog 4 years back, never in my wildest imagination did I realize that I would be able to last till now and continue. However I realize that I may have little bit when a week before an European colleague of my husband complimented my cooking as "Thank you to you and your family for inviting me for dinner. Lovely to meet your wife Deepa and your full of beans lad Abhi. It was very enjoyable and food was amazing. Best meal in Chennai ever." Believe me friends I didn't prepare the food to be anything lavish, but all I did was fine-tuned the same dishes like Seek Kebabs, Butter Chicken, Dal Makhani etc to suit his taste and it worked. I hope that I am able to host different guests both from India and the Globe in my small house and share meal with them (this includes my blogger friends also :-)). 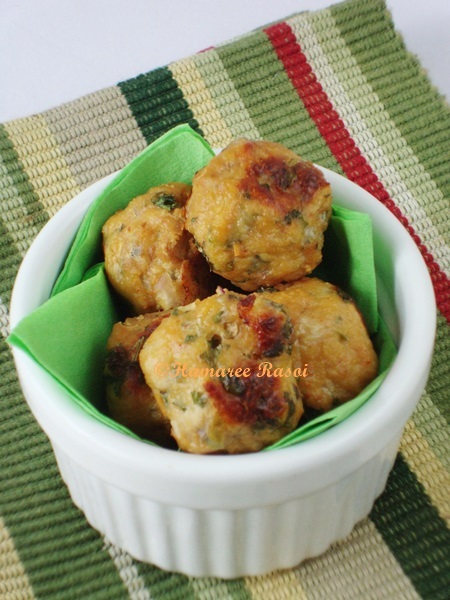 Moving on today's post is very healthy as I have baked the meatballs instead of frying. 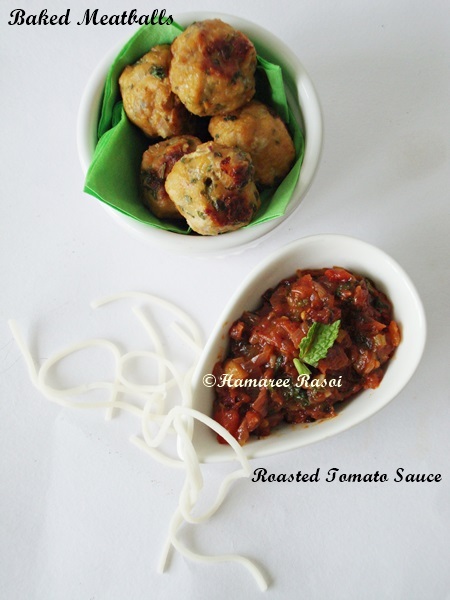 As the name suggests except for few tbsp Olive oil, I make these meatballs along with roasted tomato sauce (recipe given below). Wash the mince meat with cold water and leave it in a fine sieve to drain out excess water. Then transfer it to a large bowl, mix together everything and check the consistency if for binding you feel more cornflour is needed add so. Roll into 2 inch round balls. Pre-heat Oven to 190 Degree Celsius. Prepare a baking tray by placing foil and place onto ungreased baking tray. Space them evenly, lightly brush with melted butter and bake for about 30 minutes or until a toothpick inserted into the center of a meatball comes out clean. Remove from tray and serve the meatballs with spaghetti and sauce. Pre-heat Oven to 400 Degrees. Line a baking sheet with an aluminium foil asit will save your cleaning timing big time! 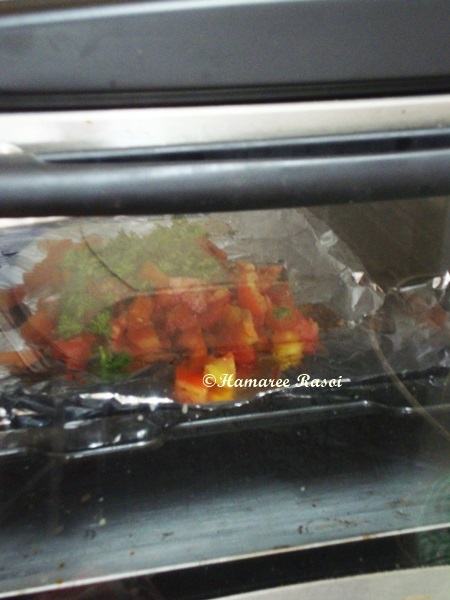 Chop tomatoes and spray a little olive oil and sprinkle some salt and place them in a baking pan along with some herbs. Roast for an hour to get that golden color on the edges and caramelized evenly. In a pan heat olive oil and add minced garlic, finely chopped red chillies and onions. Saute for 5 minutes, add the roasted tomatoes and simmer it for 20 minutes. 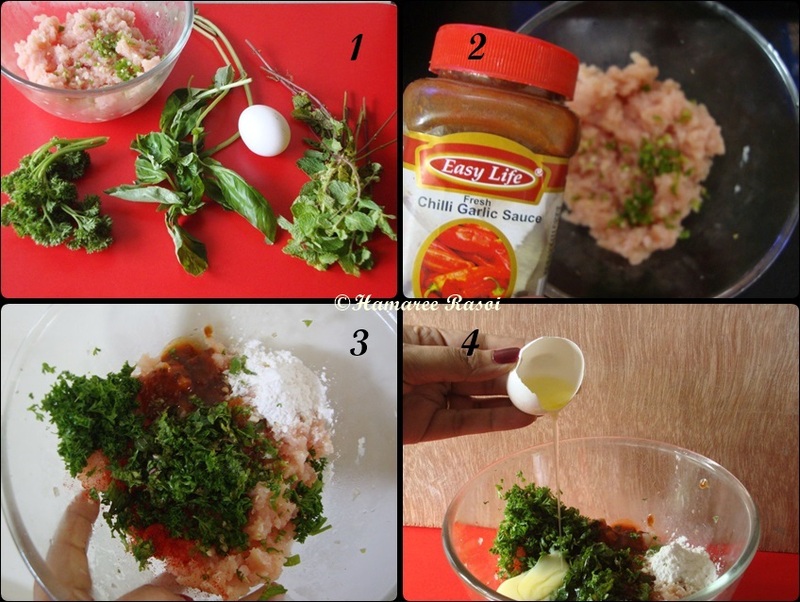 Just when you get the desired consistency add the herbs, mix thoroughly and remove from fire. Let cool and you can save the remaining by freezing it for later use. Cook the pasta according to the packet instruction and serve with sauce and meatballs. Finally top with a fresh parsley leaf and serve. wow...looks so delicious..love the way u presented, unique and inviting! 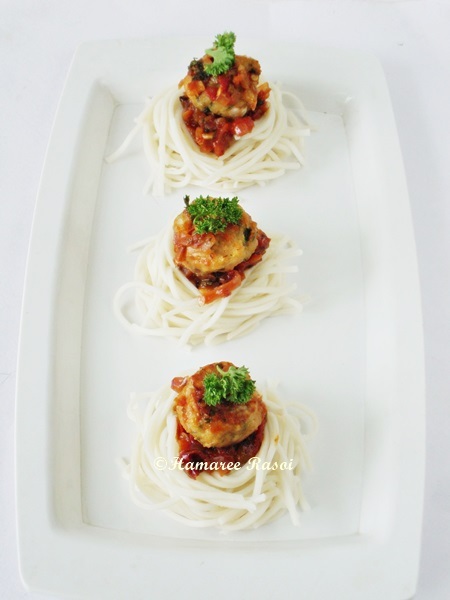 I love the way you plated those spagetti and meatball... Beautiful looking. I make baked meatballs every other week... But now that I am looking around, i haven't posted it on my blog.. :o) Time to get clicking I guess. 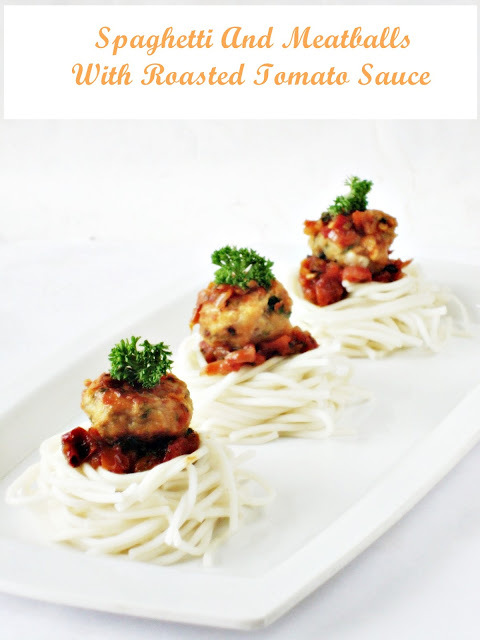 you are seriously killing me with the picture.The white background,white plate and the white spaghetti,topped with beautiful meatballs.My goodness great pic Deepa. spaghetti with meat balls are perfectly done dear. Your are tempting me by your dinner menu for your guest also...I am sure it would be an amazing choice. Keep rocking! Spagetti with meatballs looks very nice Deepa. Wow!! i love the clicks deepa.. Such a delicious dish, who can resist to those meatballs, makes me hungry here..
Beautiful presentation and a tempting dish. The dish is great with all those meatballs. jodi tomar city te jai nischoi tomar badite khbo, ki bolo? @Tabatha you can visit this Allrecipes.com website to get more pressure cooker recipes. I love pressure cooker, and this site is great. I love Italian food! This is great choice for a quick dinner. Healthy and delicious at the same time. Wow!! i love the clicks deepa..This looks delicious.Thank you for your share!